No longer does apron-clad Mom cook alone, hidden away in a closed off kitchen as the family waits in another room. These days, you’re just as likely to see a couple cooking together, or the whole family pitching in for Thanksgiving dinner, or friends gathered around the kitchen talking while a meal is prepared. The kitchen has always been a gathering center when you entertain in your home. So why not open it up and enjoy more space with friends and family? There is no reason to make do in a cramped kitchen that was designed decades ago. More and more home owners are saying hello to the open concept, especially when it comes to opening up their kitchen. We created this kitchen for our clients because they were tired of their tight space and the feeling that it was closed off to everyone. Their desire was to have a kitchen that was open and inviting, one that allowed their family and guests to sit around and talk with each other while the host prepared a meal. However, wanting an open space, and getting that open space isn’t always that easy. Our clients wanted two walls removed to open up their kitchen; however, the walls were load-bearing walls. Our team had to install two steel beams in each of the load-bearing walls. In the basement below, we installed a lally column, a round steel column filled with concrete, to provide support to the new beams. Homeowners don’t often consider all the steps that are needed when opening up a space. Many times, as in this case, HVAC ducts and drainpipes that were in the wall need to be rerouted. 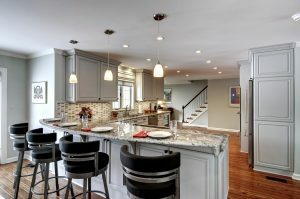 Other rooms in the house are affected while doing an open concept kitchen remodel. This is why it is important to have a plan for your family during the remodel. Sometimes the family can stay during the project, other times staying with relatives is a better option. One thing that is always certain, you must select a home remodeler who is trust worthy and can problem solve, which means you get back into your new space as soon as possible. Sometimes during a remodel, clients will opt for larger, new wall ovens. In this particular kitchen remodel, the clients’ wall ovens were surrounded by brick. Since the brick surround provided structural support to the chimney, enlarging the opening for the new ovens required some creative engineering! Additional support was added for the chimney above, and after the new wall ovens were installed, we added cabinetry to cover the bricks to match the new kitchen cabinets. Since our clients’ number one wish was to interact with their guests while cooking, we installed the cooktop on the other side of the peninsula. This provided a place for guests to sit and talk with the host while the meal was prepared. After a kitchen is remodeled, no one notices all the behind the scenes work that has been done, and that is a good thing! What everyone does notice are the finishes. We will always offer suggestions if asked, but our clients choose the countertops, cabinets and finishes. In this remodel, our client chose Natural Rocky Mountain granite countertop, along with stainless steel appliances and top knobs. 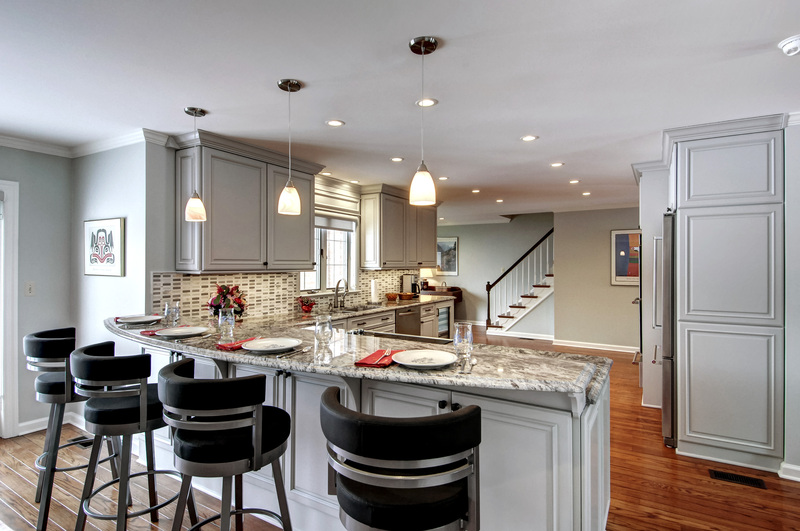 The custom cabinetry they selected has built up crown molding above the cabinets, adding elegance to their kitchen. For their wallsplash, they selected a Mosaic Icelandic blend; the outlets are underneath the cabinets to preserve the aesthetics of the wallsplash. Natural light can make a big difference in any room. Now that the wall was gone between their dining room and kitchen, sunlight can pour into the kitchen from the existing sliding glass door. No more dark, closed off kitchen. Their new space is open, bright and inviting. We want you to love being in your kitchen. It should inspire you. We believe in comfort, beauty, and functionality. Our work reflects your vision. Call today to schedule 215-513-0300 a consultation with one of our Remodeling Consultants and your vision can become your reality.